STATE IMPACT PENNSYLVANIA – A 12-inch pipeline that Sunoco plans to use as a temporary part of the Mariner East project has passed state and federal safety inspections, according to a letter from the Pennsylvania Public Utility Commission’s head of pipeline safety. Paul Metro, manager of the safety division in the PUC’s Bureau of Investigation and Enforcement, described the outcome of safety tests in a letter to three school district superintendents who asked whether the 12-inch pipe was safe to carry natural gas liquids, and whether valves along the line will help ensure its safety. 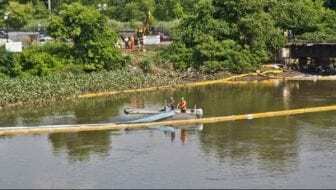 In a letter dated Nov. 1, Metro said Sunoco performed two hydrostatic tests – in which water or another liquid is pumped into a pipe or other vessel to test its ability to operate at a required pressure — in October 2017 and September 2018, and found the line maintained pressure, and did not leak. Critics’ safety concerns about the cross-state Mariner East pipelines have recently been focused on the 12-inch line after Sunoco said in July that it would temporarily repurpose the line to carry natural gas liquids along uncompleted sections of the route. The 12-inch pipe will be joined with sections of 20-inch and 16-inch pipe to allow the company to meet customer orders sooner than it would by waiting until the new pipeline — which has been repeatedly delayed by technical, environmental and legal problems — is fully constructed. Sunoco, a unit of Energy Transfer, said on Nov. 8 that it plans to start operating the hybrid line by the end of 2018. Worries about the integrity of the 12-inch pipe, which was built in the 1930s, rose in June when it leaked 33,000 gallons of gasoline into Darby Creek near Philadelphia, following at least two other leaks in its history. An investigation into the Darby Creek incident was among a series of what Sunoco called “regulatory issues” that were outstanding when it missed its previous deadline to start operating the pipeline at the end of September. On Nov. 1, a PUC spokesman said the investigation remained active. But the PUC did not respond Wednesday when asked for an update on that investigation and other issues before it regarding Mariner East 2. In response to the addition of the 12-inch line, opponents have asked whether an 80-year-old pipe could safely carry highly volatile NGLs through densely populated areas such as the western suburbs of Philadelphia. A Sunoco spokeswoman has said that the company spent $30 million in 2016 to upgrade the line. “Integrity management requires operators to proactively anticipate hazards, evaluate risks and identify preventative and mitigative actions to manage operational changes that have the potential to increase the risk of failure or the increase in potential consequences of a failure,” he wrote. The school superintendents, in a letter to the PUC on Oct. 23, said they had plans to evacuate their schools in the event of a leak or explosion from the pipeline but had not taken the 80-year-old pipeline into account. “While we are not experts in the area of safely transporting chemical products through a 12-inch pipeline, we are often asked by our parents about our plans in the case of a catastrophic breach or explosion in this pipe. We need help from the PUC to answer the question about safety,” said the superintendents, James Scanlon of West Chester Area School District, Emilie Lonardi of Downingtown Area School District, and Eleanor DiMarino-Linnen of Rosetree Media School District. Scanlon said Wednesday that Metro’s response does not appear to make the pipeline any less safe, and so his district will not be revising its plan for evacuation of its schools in the event of a leak of NGLs from the pipeline. But he was still unsure about the safety of the whole project, he said. The other two superintendents did not immediately respond to phone calls seeking comment. Metro’s letter also said Sunoco’s plan for the 12-inch line met PHMSA’s recommendations on pipelines used to carry materials in the opposite direction from their original use. The company had previously told state and federal regulators of its plans to convert that line from carrying petroleum products such as gasoline, and reverse the direction of flow. PUC inspectors confirmed that Sunoco would comply with PHMSA requirements that include emergency plans, spill response, and public awareness. Asked by the superintendents whether the 12-inch pipe contains shutoff valves for use in an emergency, Metro said there are eight valves along the 24.5 miles of the pipe that will be used for Mariner East. Six of them contain automatic Emergency Flow Restricting Devices, while two are manually operated, he said. After “lengthy” discussions with regulators, Sunoco replaced a manual valve with an automated one, and reduced the distance between automated valves, Metro’s letter said. When operational, the multibillion-dollar pipeline will carry NGLs from western Pennsylvania and Ohio to a terminal at Marcus Hook near Philadelphia, where most of it will be exported to Scotland for making plastics.